This rare Irish whiskey is limited to just 250 bottles worldwide. It is entirely aged in ex-bourbon casks. Light and delicate in character with flavours of tropical fruits, cream and digestive biscuits. Jack Ryan's pub is a famous old Dublin establishment on Haddington Road, known by many locals as Beggars Bush. The pub traded as a traditional grocers for many years with a pub and shop operating in unison. 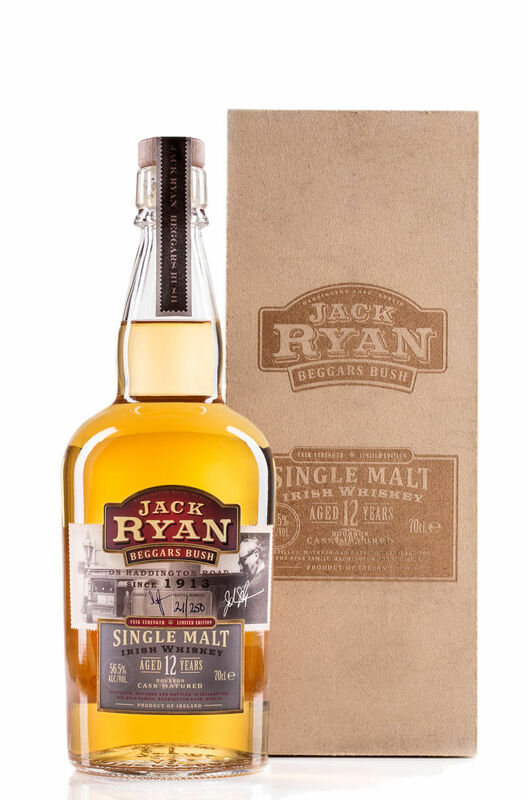 At that time they bottled their own brand of malt whiskey that was sourced from the old DWD on Jones' Road. This new whiskey is a limited edition recreation of the brand. Nose Light and fragrant with pears, apples, vanilla and honey aromas. Palate Light and delicate in character with flavours of tropical fruits, cream and digestive biscuits.